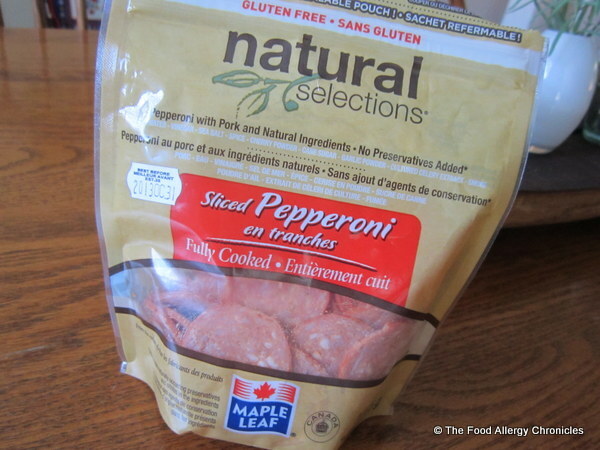 Posted on October 25, 2013 by Susan H.
Natural Selections Sliced Pepperoni by Maple Leaf. As my son, Michael, has yet to try Pepperoni (due to cross-contamination issues at the deli and products that may or may not include his allergens) I thought he might like to try this new, allergen free (for him) Pepperoni. It would be the perfect compliment on his Friday Night Pizza Night ‘Daiya Pizza’ along with all his other toppings…ham, bacon, mushrooms and onions. It was a hit…boy did it look and smell good! 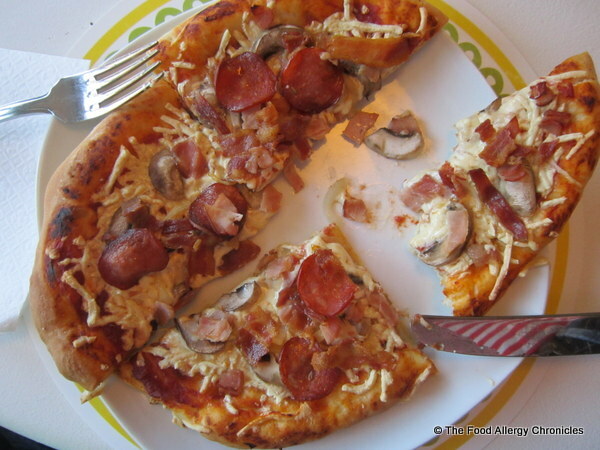 How do you top your Daiya Pizza? 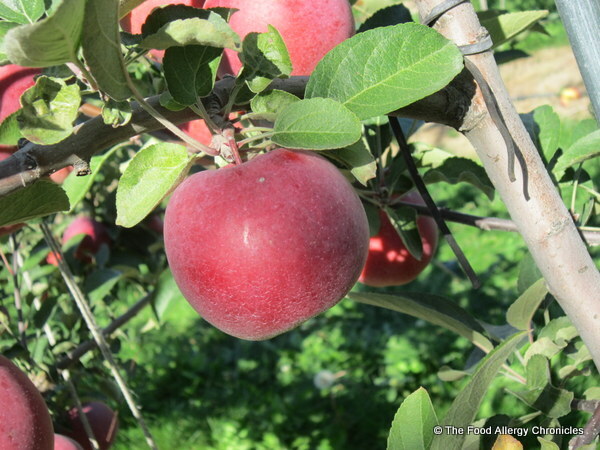 Posted on October 11, 2013 by Susan H.
Perfect time to go apple picking! It is all about apples at our house…the boys (including my husband, Andy) are super excited because ‘apple picking season’ means one thing…lots of baking with apples. Andy jumped at the chance to go apple picking with me…so we made it a ‘date’. We headed off to Watson Farm after work…it is a little bit of country nestled amongst the city of Bowmanville. Together we picked a bushel! I have already made 3 batches of applesauce, two Dairy, Egg and Peanut/Tree Nut Free Apple Kuchen Cakes , two Dairy and Peanut/Tree Nut Free Apple Crisps and I made a froze a Dairy, Egg and Peanut/Tree Nut Free Apple Pie…always good to have something in the freezer, just in case. 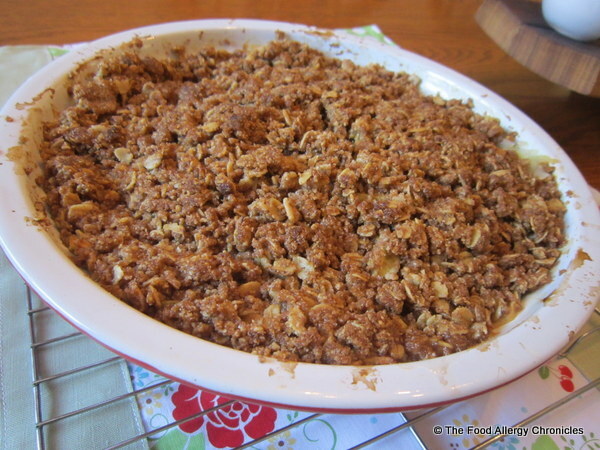 I decided to make my Dairy and Peanut/Tree Nut Free Apple Crisp with a twist…I made it with gluten-free oatmeal and oatmeal flour! No one was the wiser…in fact, Michael, Matthew and Andy all commented that the crisp was “really good”. In fact, Matthew went on to add, “Mmmmm…the apples melted down into a tasty mush”. Well, okay?…I am taking that as a compliment! If oatmeal is in your diet and you are as big a fan of oatmeal as I am…the Canadian Company, Chateau Cream Hill Estates Gluten, Wheat, Barley, Rye, Triticale, Spelt and Kamut Free Lara’s Rolled Oats and Lara’s Whole Grain Oat Flour are the ticket. 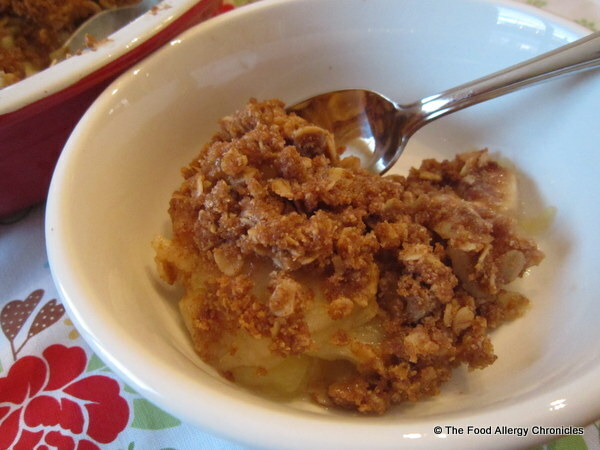 I just loved the combination of the toasted oatmeal flour and rolled oats a top the sweet baked apples. So comforting…the perfect fall dessert! The following recipe is an adaptation from Canadian Living’s Country Cooking. In a 8 inch baking dish add the sliced apples. Tip 1: Use more or less apples to fill the dish. In a small bowl, mix together the dry ingredients. Drizzle in the canola oil and mix to combine and form a crumble. Tip 2: I like to use my hands to really massage the oil in with the dry ingredients then I crumble it over top of the apples. Make sure all the apples are covered. Bake at 375 F for 30 minutes or until the apples are have softened. Tip 3: After 20 minutes, cover the dish with foil so as the top does not over cook. Just in time for Thanksgiving Weekend! Enjoy…still warm with its crunchy top! Of course now my poor bananas are being left to the wayside. No worries, I can always bake up a Dairy, Egg and Peanut/Tree Nut Free Banana Bread or Dairy, Egg and Peanut/Tree Nut Free Banana Bundt Cake. 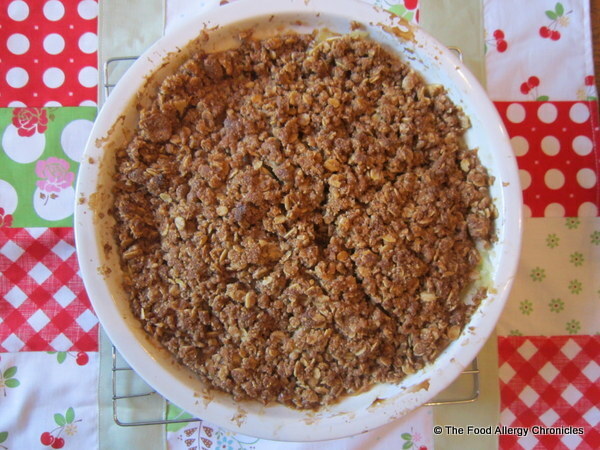 What are your favourite apple desserts? 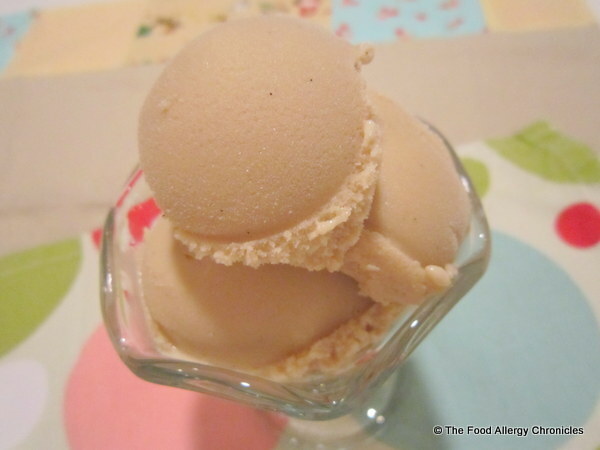 Posted on August 16, 2013 by Susan H.
Ontario peaches have hit the stores…time to try a new allergen friendly ice cream. 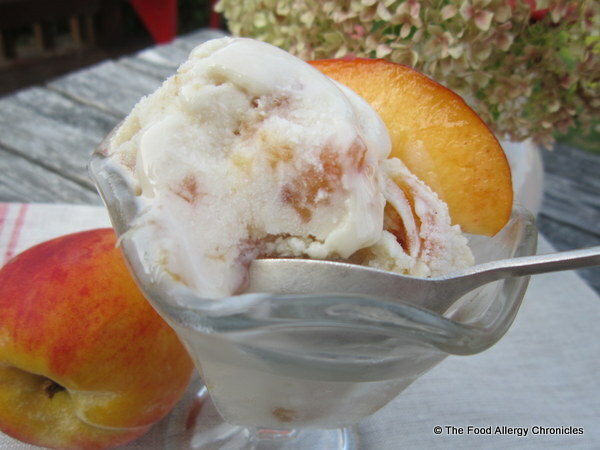 Dairy, Egg and Peanut/Tree Nut Free Caramelized Peach Ice Cream. Creamy, rich with the sweetness of summer’s best peaches…oh my! The idea sprung from the July/August edition of Martha Stewart’s Living Magazine. Click here for the recipe. 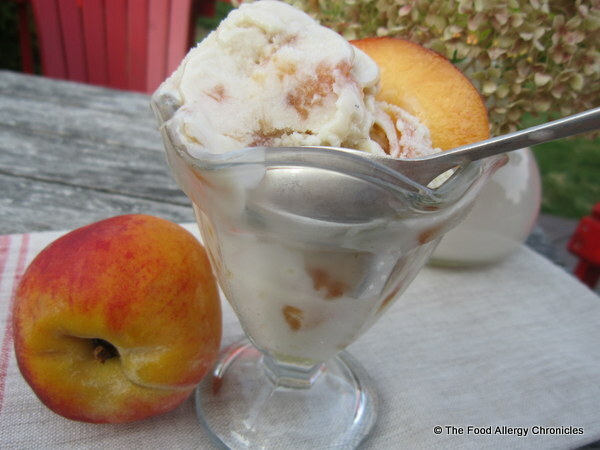 I followed the recipe for caramelizing the peaches and then just added the cooled mixture to my cooled mixture for Dairy, Egg and Peanut/Tree Nut Free Vanilla Ice Cream from the recipe in the Summer 2013 edition of Allergic Living Magazine by Senior Editor Alisa Fleming. Click here for my post. Cover peaches in boiling water and let sit for 5-10 minutes. Submerge peaches in cold water and peel the outer skin. Slice and cut into 1/2 inch pieces. Combine peaches and sugar in a pan and cook over medium heat until caramelized…stirring constantly. Let cool completely before adding mixture in at the last 5 minutes of making the Dairy, Egg and Peanut/Tree Nut Free Vanilla Ice Cream base in an ice cream maker. I poured my completed Dairy, Egg and Peanut/Tree Nut Free Caramelized Peach Ice Cream in a loaf pan that had been placed in the freezer to cool. Cover and replace in the freezer until you are ready to enjoy a bowl. The possibilities seem to be endless… so dig in. 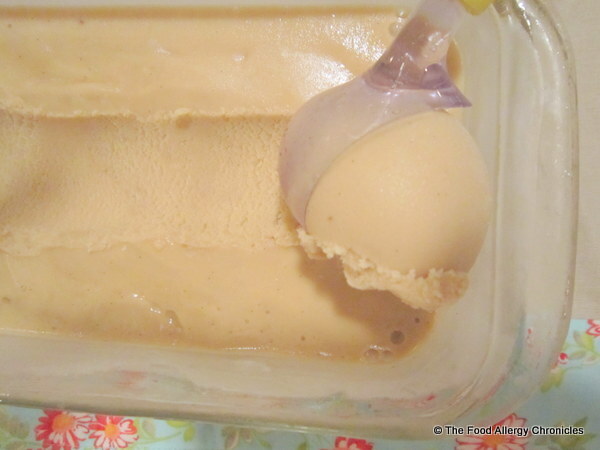 Posted on August 2, 2013 by Susan H.
Dairy, Egg and Peanut/Tree Nut Free Caramel Ice Cream turned out to be amazing! Rich and creamy with a hint of caramel…my mother, Matthew, Michael and I all deemed it to be a success. 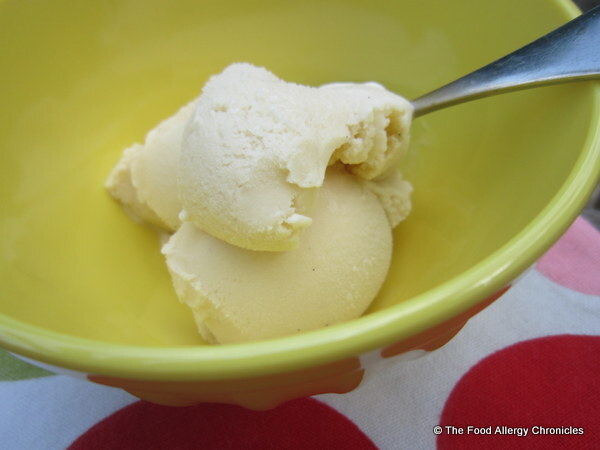 So easy to create…I just replaced the granulated sugar in the Dairy, Egg and Peanut/Tree Nut Free Vanilla Ice Cream recipe from Senior Editor Alisa Fleming’s recipe in the Summer 2013 Edition of Allergic Living Magazine with Demerara Sugar. I let the ice cream base sit overnight with the vanilla bean to get as much vanilla flavour as possible. Follow your ice cream maker’s instructions to create a batch of your very own Dairy, Egg and Peanut/Tree Nut Free Caramel Ice Cream. For even more caramel flavouring…drizzle with a Dairy Free Caramel Sauce. 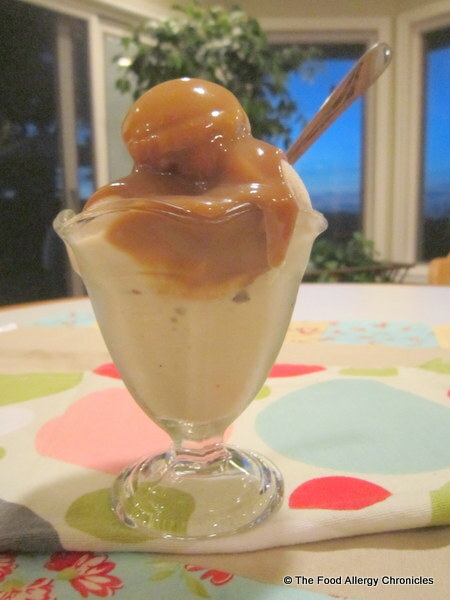 I found an easy recipe to adapt by Chatelaine Magazine recipe…Salted Caramel Sauce click here. I just replaced the butter with Earth Balance Vegan Buttery Sticks, omitted the extra salt and used Belsoy for the cream. Matthew got excited with the new Sundae dishes…he ‘went to town’ by scooping himself some Chapman’s Peanut/Tree Nut Free Vanilla Ice Cream….topping it with Dairy Free Chocolate Sauce…and taking it ‘over the top’ by crumbling a Dairy, Soy and Peanut/Tree Nut Free Brownie. Matthew enjoyed every bit of it! 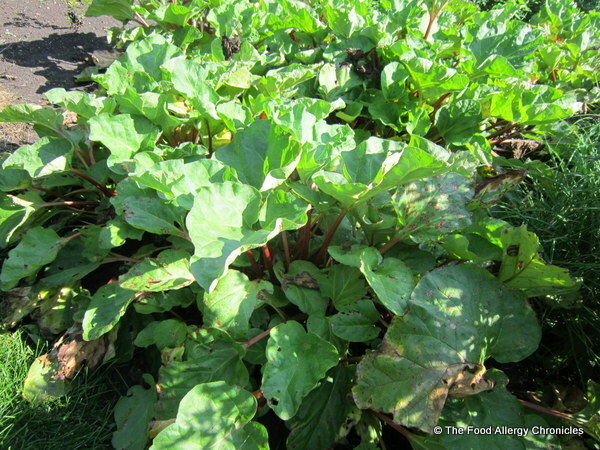 Posted on July 26, 2013 by Susan H.
I was the lucky recipient of a bunch of fresh rhubarb from my mom’s friend’s surplus of rhubarb in his garden. As her friend was invited for dinner the next day…a rhubarb dessert was in order. The combination of the tart rhubarb with the sweet strawberries with a splash of orange married very well. The recipe is from Canadian Living Magazine…click here for the recipe. 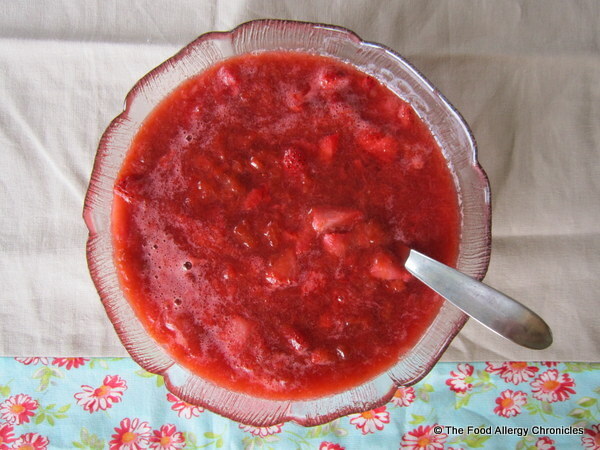 Tip 1: Strawberry Rhubarb Sauce is equally as nice spooned over a bowl of fresh strawberries and blueberries, dairy free yogurt, or how about over one’s morning oatmeal or allergy friendly granola. Tip 2: Replacing the orange juice with lemon juice would make a nice change. 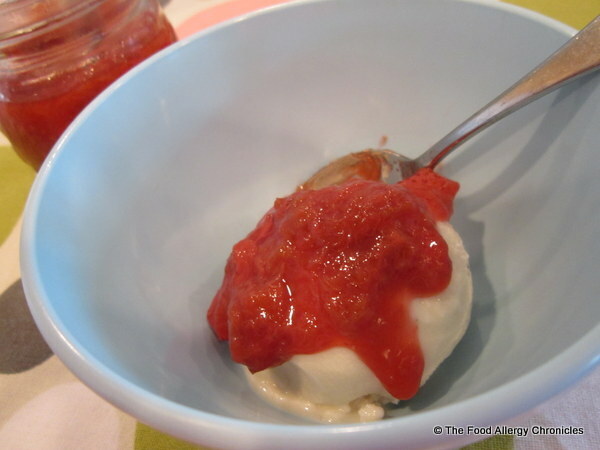 How do you like to enjoy your Strawberry Rhubarb Sauce? 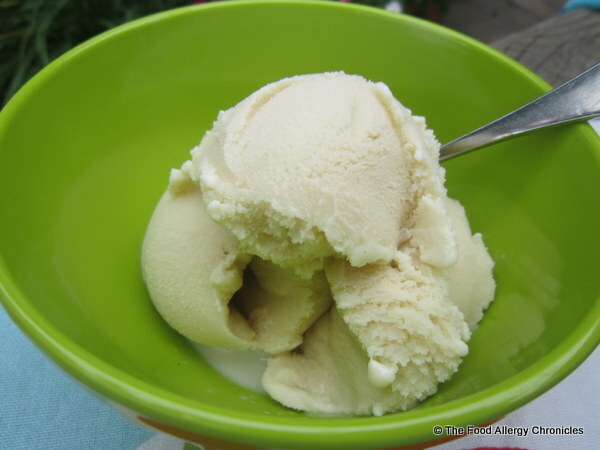 Posted on July 19, 2013 by Susan H.
My first memory of savouring the genuine flavour and texture of pure vanilla ice cream was back in grade school when our class was studying the pioneers…we churned our own ice cream. It was one of those ‘ah ha’ moments when I could fully understand and appreciate my father’s love of vanilla ice cream. Of all the 31 flavours that Baskin Robbins would sell…my father always opted for vanilla…it used to baffle me. On our trips to visit relatives in England and Scotland…I would fall under my father’s spell of vanilla ice cream. Our mission…to search for signs advertising Wall’s Chocolate Covered Ice Cream Bars. Their ice cream bars were so rich and creamy…they had this gorgeous hue of butter, covered in a rich crunchy layer of chocolate. 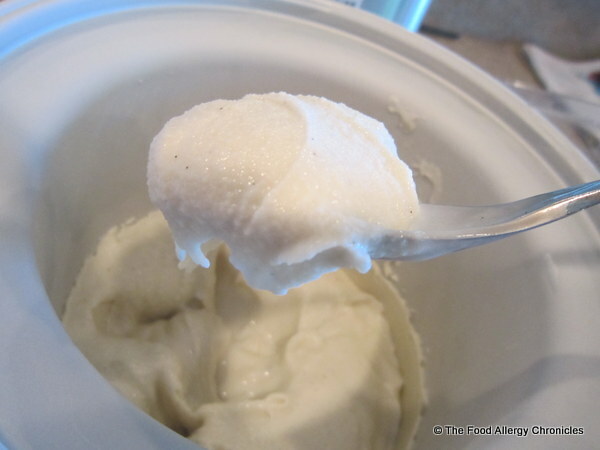 I hoped to capture that true vanilla flavour with the Dairy, Egg and Peanut/Tree Nut Free Vanilla Ice Cream in the ice cream maker…I believe this recipe manages to do just that. Rich and creamy with a lovely vanilla almost butterscotch flavour. Michael’s eyes lit up when he had his first spoonful. “Mmmmmm, now this is good”, he exclaimed with a Cheshire cat-like grin on his face. This recipe has been slightly adapted from Allergic Living Magazine’s Senior Editor, Alisa Fleming’s recipe in the Summer 2013 Edition. Whisk the cornstarch with the 1/4 cup of soy beverage…set aside. In a saucepan, combine the rest of the soy beverage, sugar, honey and Belsoy. Bring to a boil slowly. Whisk in the cornstarch mixture and continue to boil for another 2 minutes. Remove from heat and stir in the salt, scraped vanilla bean seeds and the vanilla bean. Be sure to remove the vanilla bean before pouring into the ice cream machine. Follow your ice cream makers instructions. P.S. Did you know that it’s National Ice Cream Month? Why not enjoy a Sundae on Sunday to celebrate! 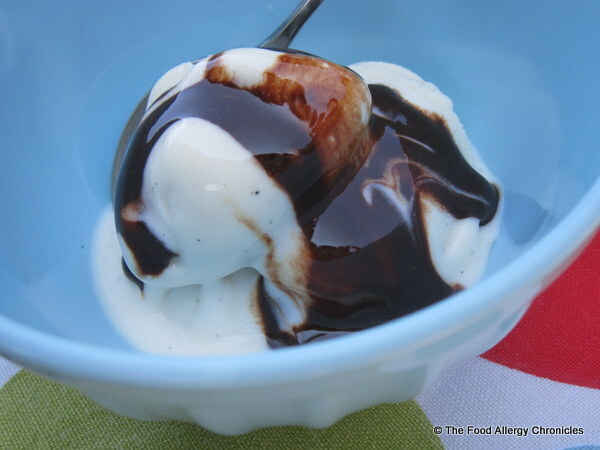 For a great Dairy Free Chocolate Sauce to drizzle over top of your Sundae click here for a recipe. 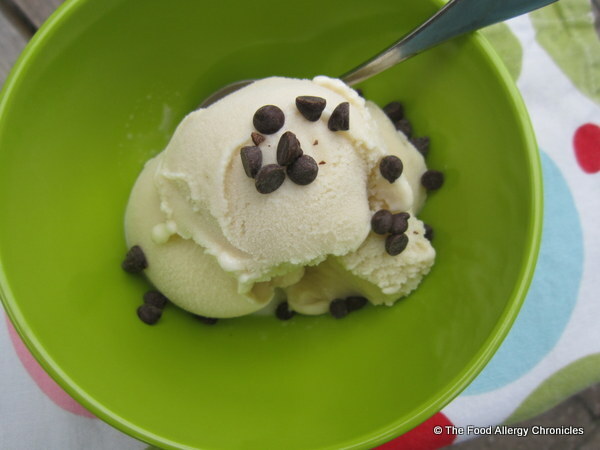 Michael’s next flavour to try…Dairy, Egg and Peanut/Tree Nut Free Mint Chocolate Chip Ice Cream. 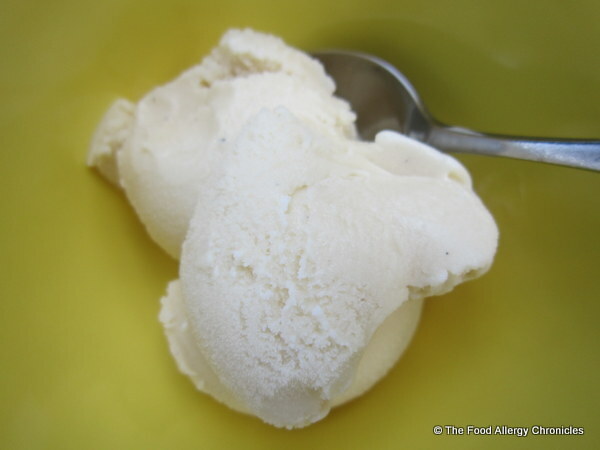 Posted on July 16, 2013 by Susan H.
Dairy, Egg, Peanut/Tree Nut Free Ice Cream to be exact. I was super excited when I purchased our very first ice cream maker…now I am over the top excited to discover how easy it is to whip up a batch of one’s own Dairy, Egg and Peanut/Tree Nut Free Ice Cream. Not as convenient perhaps as popping by the grocery store to purchase a carton…but certainly worth the time it takes to make it so one can enjoy the childhood treat that every child should experience come summer time. I decided to try one of Allergic Living Magazine’s Senior Editor Alisa Fleming’s recipes from the Summer 2013 Edition. Michael’s favourite flavour is vanilla…so vanilla was our first attempt. However, as we used coconut milk in the base…the ice cream had more of a coconut flavour…but it was oh so creamy! In a small bowl, whisk the 1/4 cup of non-dairy beverage of choice with the cornstarch…set aside. In a saucepan, whisk together the remaining non-dairy beverage, coconut milk, sugar and honey. Bring to a boil over medium heat…let boil for 3 minutes. Whisk in the cornstarch mixture and continue to boil for another 2 minutes. The mixture will start to thicken slightly to resemble cream. Remover from heat and stir in the salt and scraped vanilla bean seeds. Pour into a liquid measuring cup…easier to pour into the ice cream machine. Follow the directions of the ice cream maker to create your batch. Dairy, Egg and Peanut/Tree Nut Free Coconut Ice Cream was delicious covered in Dairy Free Chocolate Sauce! 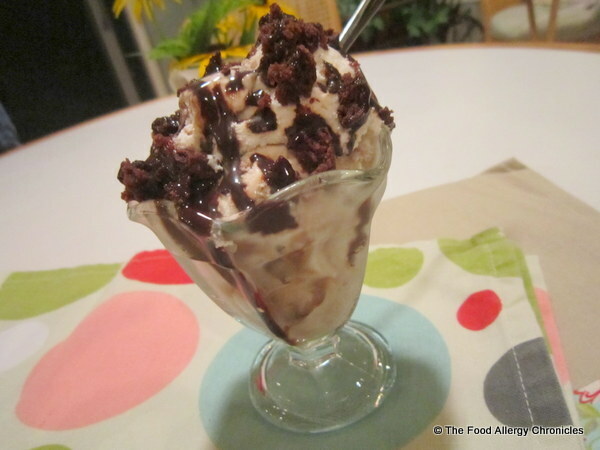 Reminded me of a Bounty Chocolate Bar…love the speckles of vanilla bean in the ice cream. 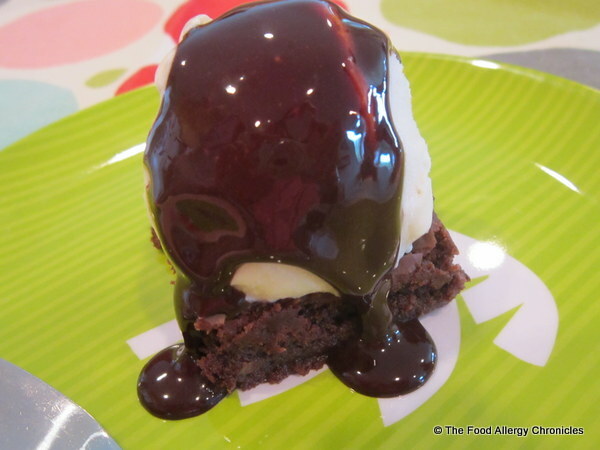 My boys love the Dairy Free Chocolate Sauce I make from Anne Lindsay’s Smart Cooking Cookbook…I like to replace the corn syrup with honey. In a saucepan, combine the cocoa and sugar. Whisk in the water and honey. Bring to a full boil on medium high heat. Stir constantly for 2 minutes. If you love coconut…then this is the recipe for you. Unfortunately, my two nephews and Matthew were not fans…although, John and Matthew gobbled it up when they stirred in the Dairy Free Chocolate Sauce. Michael, on the other hand, loved the texture…”I like this better than the Natur-a”. Well, thank goodness for that…as it is no longer available! Michael thoroughly enjoyed his bowl of Dairy, Egg and Peanut/Tree Nut Free Coconut Ice Cream with Dairy Free Chocolate Sauce…I am elated! 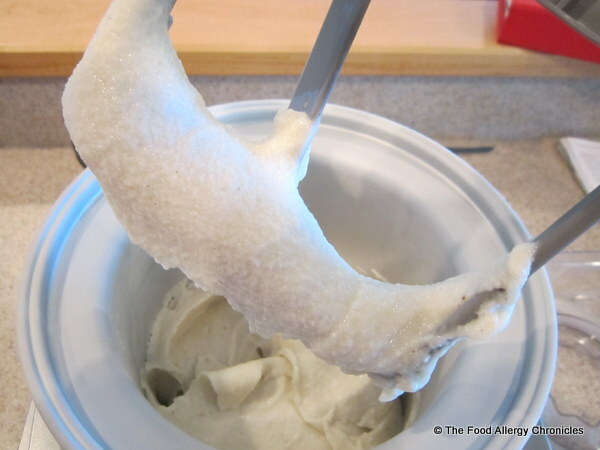 Next up…’churning’ a batch of Dairy, Egg and Peanut/Tree Nut Free Pure Vanilla Ice Cream! 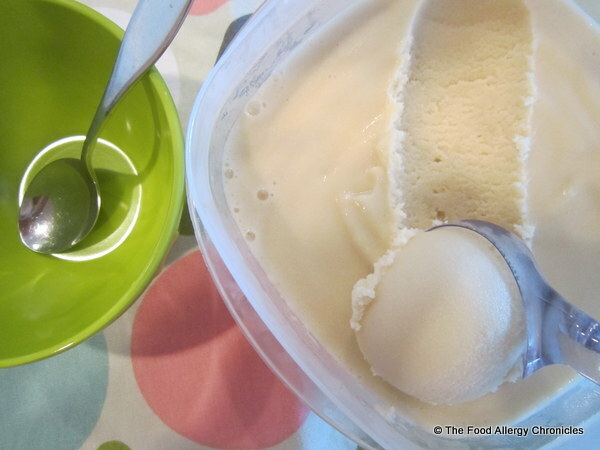 Have you tried ‘churning’ an allergy friendly version of ice cream in an ice cream maker? Posted on July 10, 2013 by Susan H.
Tip # 25 from Anaphylaxis Canada’s Youth Advisory Panel at Why Risk It? . Click here for the entire list. I wanted to celebrate the boys achievement of their Honours average this year by taking them out to a fancier restaurant in town that I had heard caters to those with food allergies…unfortunately, the boys were not interested. What they did want to do was to go back to the Lone Star Texas Grill Restaurant. Click here for my post on our first trip there this year. As I had set the stage by calling and enquiring about Michael’s food allergies (dairy, egg, beef, lamb, sesame, peanut/tree nuts, fish, shellfish, mustard and raspberries)...I felt this would be a great opportunity for Michael to review with the manager his food allergies to make sure the restaurant could still accommodate his food allergy needs. The day we decided to go, Michael called ahead. Unfortunately, the manager was in a meeting so the assistant manager took the call. She basically told Michael that the restaurant would not be able to accommodate his food allergies. Michael related to her his last visit…she put him on hold. Upon her return, she assured him that the restaurant would be able to meet all his food allergy needs…so all was a go. Our family was seated, menus distributed, drinks were ordered…I questioned Michael when he was going to ask to speak to the manager. “When she comes back and we order our meal”, he answered. The manager on this evening, happened to be the first manager I had talked with over the phone for our initial visit. (he was not the manager working the night we actually ate at Lone Star) Michael reviewed with him his meal from the last time…the complimentary nachos and salsa, chicken fingers dusted in flour, salt and pepper and fried with French fries without any spices on them in a fryer that was free of all his allergens. The manager came out to enquire if flour was okay…he even checked the plum sauce for mustard and brought out a dish of it for Michael when it was given the all clear. I know I felt much better knowing that the manager was the original manager who had organized Michael’s meal…even Matthew stated, “I feel so safe here”. Once again, our family was well taken care of at our local Lone Star Texas Grill Restaurant. I would like to think all the franchises are similar. Has anyone else dined at the Lone Star Texas Grill with their food allergies? What was your experience? 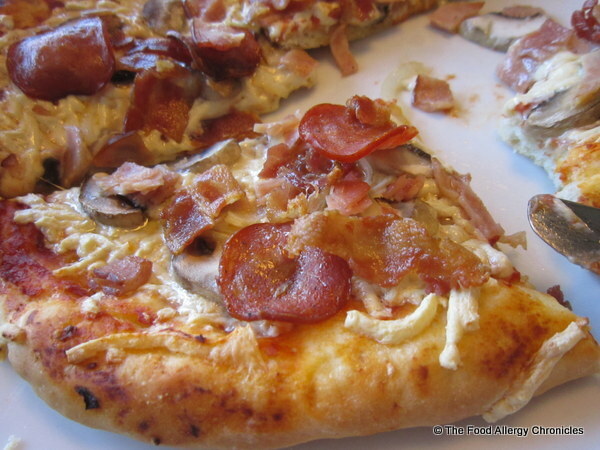 What restaurants have you found to be accommodating to your food allergies? Please share.